Home > Chicago,_IL,_USA > Vendors > Polo_Cafe_and_Catering_Bridgeport_U.S.A. Now in his 25th year, chef/owner/innkeeper Dave Samber and his Staff continue to bring "something different . . . something wonderful!" 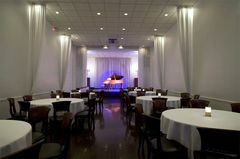 to their clients and customers through the highest commitment to hospitality excellence, offering its elegant "Old Eagle Room", a renovated 1914 neighborhood theatre, for showers, rehearsal dinners, ceremonies & receptions up to 100 guests. It uniquely offers its new Bridgeport Bed and Breakfast for overnight accommodations. 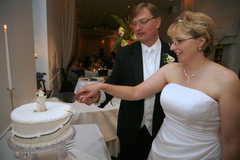 We had our wedding at The Polo Cafe in Chicago (Bridgeport) in their "Old Eagle Room". The Polo Cafe provided one-stop shopping for us. 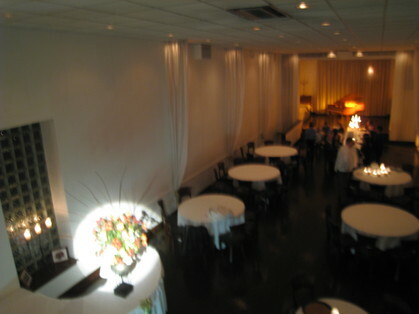 The Old Eagle Room was elegant and intimate. Our wedding ceremony was performed by a judge and took place on the candlelit stage. The food, prepared by owner/chef David Samber, was exceptional -- our guests raved about it. After dinner, the disco lights came on (as we requested) and the stage became an exciting dance floor. We put together our own music mix on our iPod and plugged it into their sound system. Everyone enjoyed it. The Polo Cafe made our special day a huge success. I can't recommend it enough.